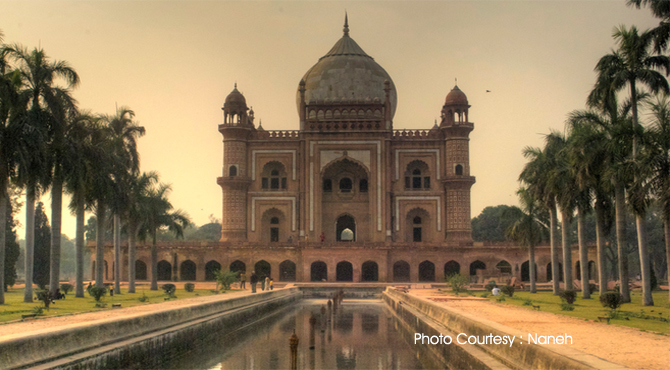 Built in 1754, Safdarjung Tomb,a marble and stonework mausoleum in Delhi is another example of Mughal architectural brilliance. The tomb was described as "the last flicker in the lamp of Mughal architecture". Located near the Safdarjung Airport at the "T" junction of Lodhi Road and Aurobindo Marg (road) in New Delhi, Safdarjung tomb is a reasonably well maintained monument. It is located at a walking distance from the Lodi Garden. It is now under the control of Archaeological Survey of India (ASI) who have their offices in the pavilions and also a library over the main gate. The complex also has a madarsa. The Tomb was built after the death of Aurangzeb by Nawab Shua-Ud-Daulah in 1754 in memory of his father, Mirza Muqim Abdul Mansur Khan, also known as Safdarjung. Set in the middle of a garden, which spreads over an area of 300 sq m, the tomb shares some similarities with the famous Humayun's tomb. The tomb was built by an Abyssinian (Ethiopian) architect, Bilal Mohammed Khan, at the exorbitant cost of Rs 3 lakhs. The construction work began in 1753 and was completed in 1754. The tomb itself is in the centre of a large garden, on the pattern of the Mughal Charbagh style has an area of 2,952 square feet (274.2 m2), with pools joined by channels. The compound is divided into four equal squares by wide pathways and tanks. Each of the squares are further subdivided into smaller squares. The compound is surrounded by a high outer masonry wall, with channels over them to carry water to different pavilions. The pavilions are laid out in the western, northern and southern directions and are named Jangli Mahal, Moti Mahal and Badshah Pasand respectively. Nawab’s family used to reside in these pavilions. The wall contains a series of arches on its inner side and the four corners are articulated with octagonal chhatris. The Entrance is from the Eastern side, through an impressive doube storied supercilious gate. The gateway contains several apartments, a courtyard and even a mosque. The mausoleum is a square double-storeyed structure, surmounted by a bulbous dome of marble built on a wide, terraced platform. The central chamber is carved and finely polished, surrounded by oblong and square compartments. Sunlight enters through the latticework. The three-domed and arched mosque with whaleback roofing at the entrance is a later addition. Arches and domes were believed to be introduced to India from Turkey and Persia. The tomb is made of buff-colored sandstone with the intermittent use of red sandstone and marble in its facing and a large proportion of which was abstracted from the tomb of Abdul Rahim Khan-i-Khanan used for the making of Safdarjung's Tomb. Red and buff stones are the materials used for building the main mausoleum which measures 28 m square. The central chamber of the tomb stands surrounded by eight rooms all around with a cenotaph in the middle. There are partitions in rectangular shape and the corner partitions are in octagonal shape. The interior of the tomb is covered with rococo plaster with decorations. There are four towers around the main tomb at the corners which are polygonal in shape. They have marble panels which are faded, and decorated arches. There is an underground chamber in the mausoleum which houses the burial chambers or graves of Safdarjung and His wife. The ceiling of the Tomb is decorated with plasterwork that has been painted. To the south of this tomb is the historic site of the battlefield where Timur along with his Moghul Army had defeated Emperor Muhammad Bin Tughlaq in 1398 AD.